Actor Ajay Devgn on Friday shared the first look of his Marathi film "Aapla Manus", and it features Nana Patekar as a common man riding a bike on a stormy night. The film is directed by Satish Rajwade, and also features Sumeet Raghavan and Irawati Harshe. "And here it comes... The first look of our Marathi film 'Aapla Manus'. Nana Patekar, Satish Rajwade, Sumeet Raghavan, Irawati Harshe, Sudhanshu Vats," Ajay captioned the look. "Aapla Manus" explores the story of a young couple living with the man's father, juggling the pressures of urban life and managing the complexity of relationships. An unexpected incident forces them to question their beliefs about their life and family. "The support and love I have received over the years has made me always want to give more to my fans. As a producer, 'Aapla Manus', is my first attempt to showcase my gratitude to the people of Maharashtra and I hope it will get appreciated by all," Ajay said in a statement. "We have seen enormous audience growth in the Marathi filmscape in the past few years; not just in terms of box office performance but also in terms of the variety of genres," Ajit Andhare, COO, Viacom18 Motion Pictures, said in a statement. "'Aapla Manus' is a thought provoking film that will move the viewers and question perspectives. As we embark on this journey together with Ajay Devgn FFilms, Watergate Marathi Motion Pictures and Shree Gajanan Chitra, we are certain that the movie will stand out from the clutter," Andhare added. 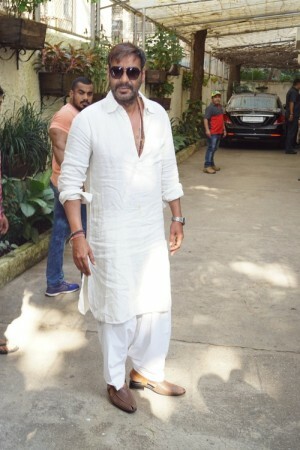 Earlier this year, during the shoot of the movie, Ajay shared a photograph on Instagram in which his wife and actress Kajol was seen giving the clap on the first day of filming. "Aapla Manus" is slated to release on February 9.